I hope he wins. It’ll be much more interesting than the other option, but a day ahead of the election, I still wonder if we won’t be “shocked” by the news that McCain somehow pulled out a dozen states that he wasn’t expected to win, while charges of electronic fraud and broken machines, and lack of ballots, pile up all over the place. Democracy Now! covered the story of a guy who is being deposed today, a fellow accused of masterminding the election fraud perpetrated by Cheney/bush in 2000 and 2004, by forwarding the results from various states like Ohio to an intermediary computer in Tennessee where of course the results were doctored to suit their goals. Probably we’ll have President Obama, and then it’ll be interesting to see if he will break with his sponsors at Goldman Sachs and the coal and nuclear industries to pursue the grassroots-supported “Green Economy,” one which is fraught with contradictions itself, but is being pushed by countless small groups, independent political actors, and is somehow embedded in a lot of folks’ deep aspirational psyches… or so it seems. To some extent the analysis in Nowtopia taps this too, though my book of course tries to reframe these aspirations in terms of class and an anti-capitalist agenda. Another piece of this unfolding crisis is the collapse of economies all over the world, from Ukraine and Iceland to the unravelling of Latin American economies too, underscoring how little the so-called “Center-Left Regimes” of Lula, Evo, Chavez, Kirchner, et al, really broke with the underlying dynamics of neoliberal world markets. Long-time socialist analyst of Latin America James Petras writes about this at length here (again, thanks to Automatic Earth for the original link). Locally there’s the Gay Marriage initiative in California, which seems like it’ll be defeated, but it’s a toss-up. Marriage is such a dumb institution and many of my more radically inclined friends, past and present, among the sexually libertine of various persuasions, understand that a big impetus for sexual radicalism was to overcome the limits of marriage…. so it’s quite sad to see it become the rallying point for gay politics, but that really just confirms the obvious limits of gayness as a political stance… all that said, of course gay marriage should remain legal, with all the rights and responsibilities it entails, spousal and otherwise. Better if we could do away with marriage in general for everyone, rather than extending the tired, inhibiting and basically reactionary church- or state-based institution further. While all this is going on, life in San Francisco continues to be deeply satisfying, in spite of all the madness that prevails nationally and even in local politics. 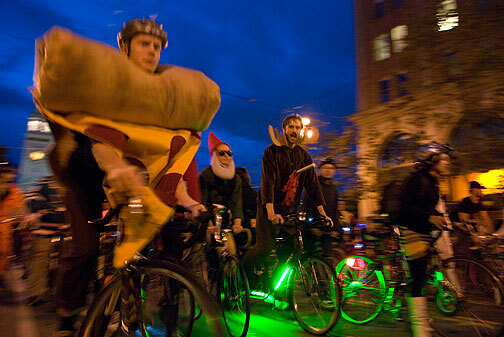 The end of October brings the biggest muncipal holiday, Halloween, which fell this year on Critical Mass Friday. The ride took off after rain a day earlier (which returned as a real deluge on Saturday, so we got lucky!) under blue skies and incredibly balmy warm weather. 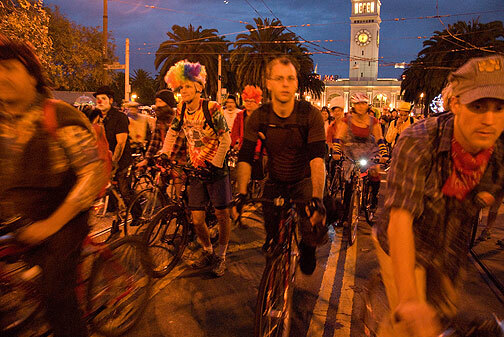 Halloween Critical Mass departs, Ferry Building behind. Photo by Eduardo Green. 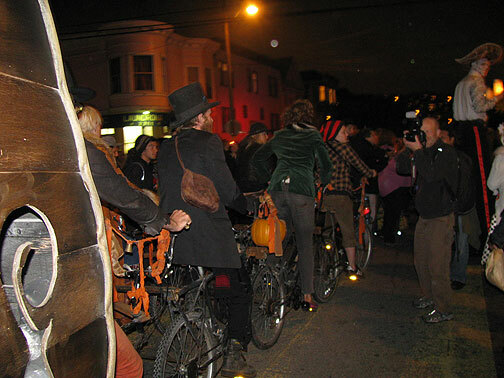 Halloween Critical Massers glowing to match the sky. Photo by Eduardo Green. 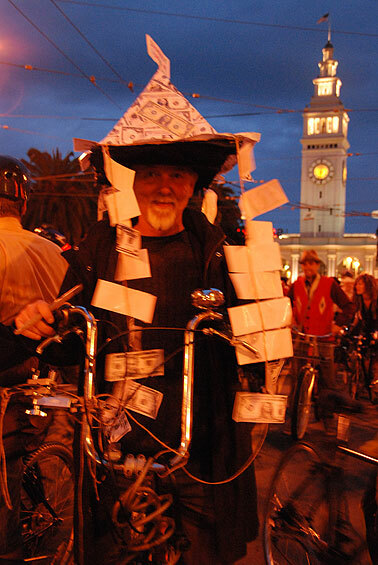 The Pyramid Scheme at the start of Halloween Critical Mass, San Francisco, 2008. Photo: Eduardo Green. 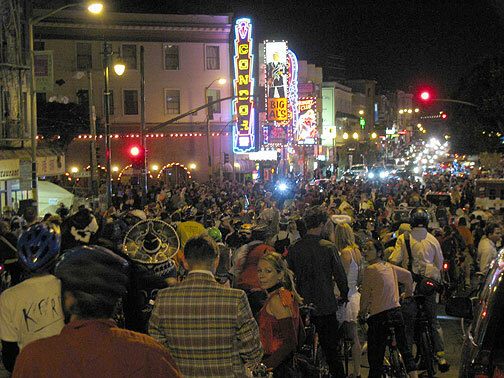 Stalled on Broadway, the party is ongoing! 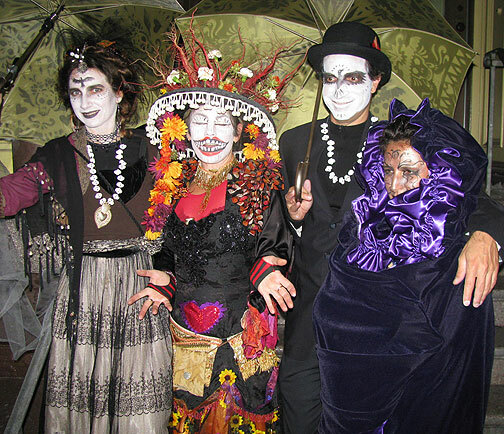 Pyramid Scheme meets $700 billion bailout, Halloween 08! 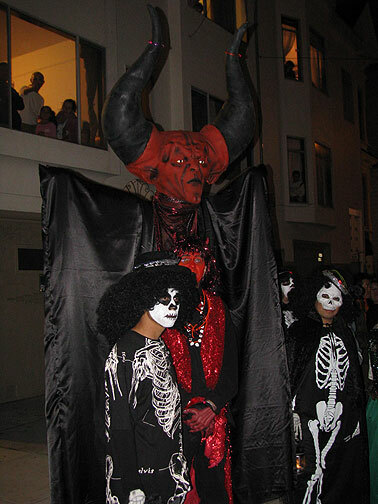 Then, on November 2, here in the Mission we have a big Dia de los Muertos procession, which is a remarkable event. 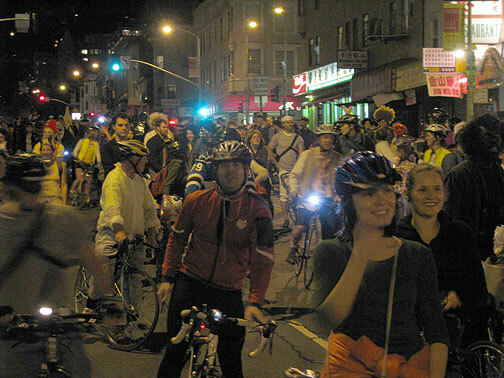 It’s very embedded in this neighborhood, with its strong Latino population, but this event has been thoroughly transformed (some would say co-opted) by the strong embrace of the youthful hipster scene, the folks who have been moving in to this neighborhood steadily for over 25 years. 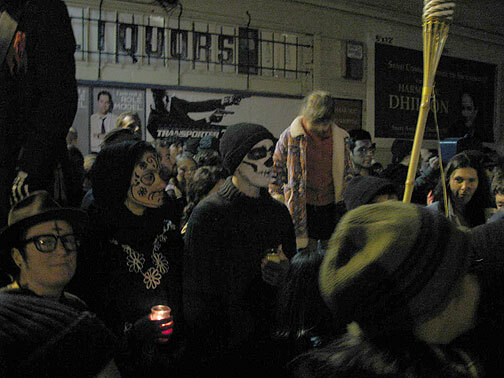 Dia de los Muertos gathering point, 24th and Harrison. 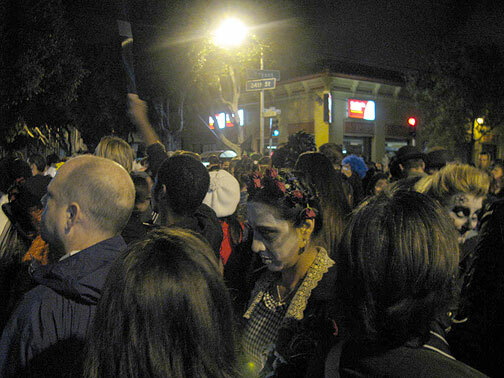 Revering and remembering the dead happens via memorials, altars, installations in local galleries, and just somberly joining the march with a candle. 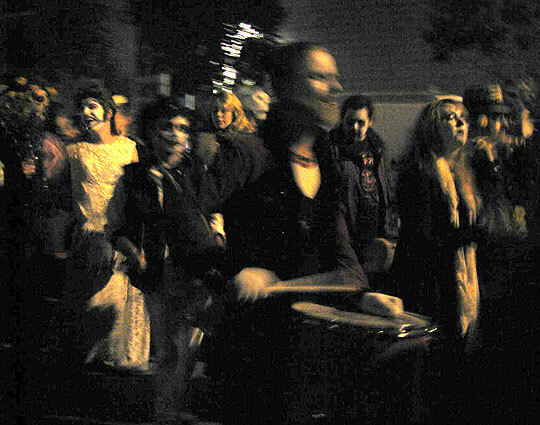 Simultaneously hundreds of people are drumming, dancing, and carrying on like it’s Carnival, heavily costumed, and in altered states. One of the more impressive get-ups along Harrison. Something new this year, beyond the usual Aztec drummers, a samba troupe, and two other drumming contingents and many many dancers, was this Vehicle of the Apocalypse, drawn by six cyclists welded to the wagon… quite an impressive piece of work! 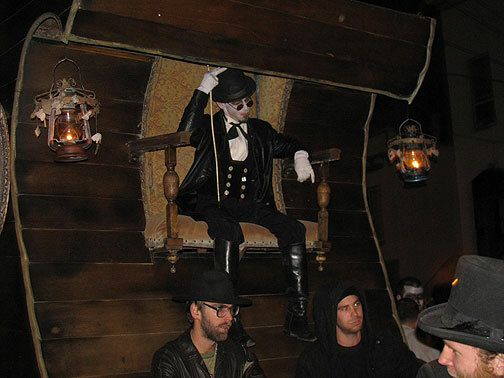 The Ringmaster of the Apocalypse! Tomorrow we’ll finally be done with this quadrennial madness that passes for politics in the U.S.! I can’t wait! But I’m glad real life continues to percolate in so many ways, all too often out of sight, but if you’re living it, it’s a great antidote to the sad, lonely, empty rituals of modern America.